I’m not entirely sure how it happened. Maybe I turned my head? Blinked longer than I should have, and there she went. Grew up and went right out the door with a backpack on her back. Shiny black shoes on her feet and more bubbles of excitement than any other regular given day. New doors are opening, others simply have quietly shut. It’s a big one for both of us, so I’m taking it in. Taking it all in. The last baby bird just went to school. This entry was posted in Photography, Rambles, Waffles and Digressions by cityhippyfarmgirl. Bookmark the permalink. A bittersweet time and one never forgotten; still brings tears to my eyes to remember when this was me and my youngest, 20 years ago! Enjoy your new era. There is. A constant choice of opening and closing doors eh. Incredible isn’t it Brydie? I have one in year 5 and one in year 2 this year. How did this happen? Are your two both now catching the bus Jane? Beautifully written. I dont have children, and yet your words transported me to that place & moment. Take care in this transition to enjoy each moment. That’s kind Tamara, thank you. 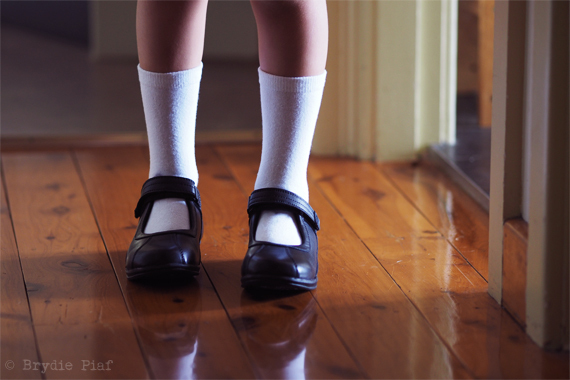 Oh bless those little school feet. This will be me next year Brydie. It will be time to let go and enjoy a new beginning. Big hugs. Big things are waiting for both of you. It’s crazy, isn’t it? People tell you that kids grow up quickly and, at some level, you don’t really believe it and then it happens to your kids. My eldest has just finished high school and is about to start uni and I’m in shock! I hope your daughter is loving it. Starting uni is another big (massive!) milestone isn’t it. New adventures for both of our kids! On the upside there are some pretty wonderful squeezy hugs when school is all done and dusted for the day.